If I'm eating a hamburger, it has onions. There's no debate. 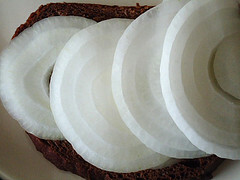 Red onions. Sweet vindalias sauteed in a little butter until they get that nice caramel color. It doesn't matter to me. Unfortunately for Rusty, what's good for me, is not so good for him. According to Dr. Jonathan Kreissler, DVM, raw, uncooked onions have chemicals in them that can cause "oxidative damage" to the red blood cells of our canine companions. According to Dr. Mike Richards, DVM, it probably doesn't matter whether they are cooked or not. Dogs should just not be indulging in onions. As the chemicals in onions attack your dog's red blood cells they begin to alter them causing your dog to exhibit signs of fatigue (panting, getting tired quickly for no apparent reason), vomiting, diarrhea, vomiting, blood in the urine, and yellowing of eyes/skin/gums. Essentially it's inducing a form of anemia. This effect can take place immediately if enough onions are consumed or even over a period of time if your canine pal is just snacking on a little here and there. The best thing that you can do for treatment is get your dog to the vet. They may induce vomiting, although most of the sources that I've researched suggest that transfusions are required. That's pretty scary, so keep an eye on that hamburger or salad when you turn to talk with your family or change that channel on the TV. While it might taste good, the effects of onions are your pooch can be severe. "My Dog Ate Cooked Onions!" This applies to cats as well. Look through the sources provided for additional background on this.